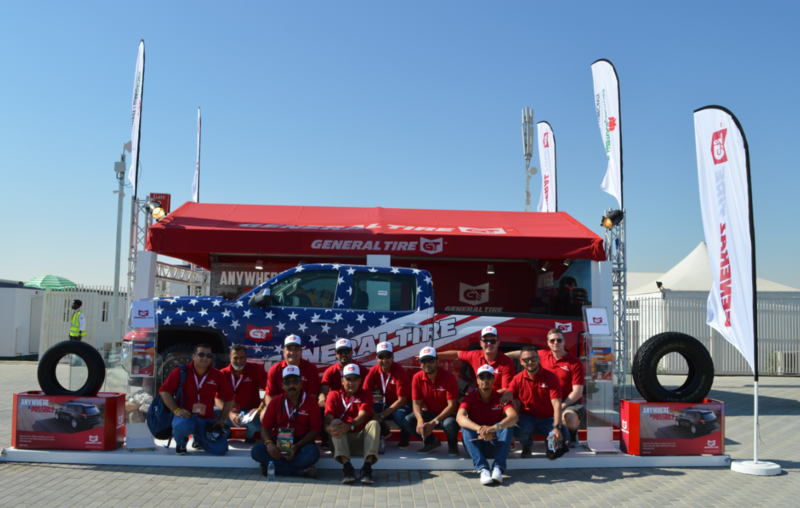 General Tire shares its passion with rugby fans at Dubai Sevens tournament. Middle East – 6th December, 2016 – The biggest Emirates Airline Dubai Rugby Sevens to-date, which took place last weekend, hosted leading tyre manufacturer General Tire, one of the key brands on show. At a tournament where spectators saw high octane action and crunching tackles on the pitch, General Tire used their presence to help attendees stay safe on the roads with a tyre safety stand. Highly trained staff from General Tire’s UAE partner, Al Habtoor Motors, were available on-site at the sports tournament talking to spectators about need-to-know tyre and road safety tips as well as showcasing their range of high-performance products. In addition to dispensing essential advice about staying safe on the roads, General Tire also offered visitors vouchers for 15% discounts on tyre changes at UAE outlets. Known for its involvement in the competitive world of off-road racing, General Tire has built up a wealth of expertise on how to get the best out of its products on the dunes as well as on the roads and were able to advise customers on the most appropriate tyre for their lifestyle. “Rugby is a rugged game at times so for us, as manufacturer of high performance tyres, it makes sense to be here advising visitors on how our tyres can help them have more outdoor adventures but also how they can keep themselves safe,” commented Ricardo Martins, Head of Marketing for Continental Middle East, the parent company of General Tire. Catering to customers ranging from high-performance vehicle owners to family car drivers, General Tire products offer a smooth, comfortable ride and deliver precise response. Moreover, the brand is perhaps best known for its SUV and all-terrain Grabber™ range of tyres that provide handling, durability and performance for passenger cars as well. On the 47 anniversary of the Dubai Rugby Sevens, held on 1-3 December, General Tire also hosted partners from five different countries across the region. General Tire partners from Egypt, United Arab Emirates, Kuwait, Qatar and Oman were all invited to the Sevens as a means of celebrating the end of what has been a successful year in terms of growth and expansion in the Middle East. With more than 100 years of experience in the tyre industry and as part of Continental AG - a leading tyre manufacturer based in Germany - General Tire was founded in Ohio, USA, in 1915. Since then, the automotive brand has been an innovation leader, introducing new styles and technology to adapt to changing needs by providing top quality products designed for every weather condition.